I was asked to assist with an issue someone has whereby when they do a race with a certain car and select the 2nd driver to drive for them, upon pitting, the car doesn't restart for them. Using the 1st driver or driving the car themselves this issue doesn't happen. This is only in race mode. Its not the eng file so that's already ruled out and the hdc pitting settings seem fine too. Anyone have an idea why? That was my 1st thought too...not enough initial torque or 1st gear too high but it drives off fine. The putting lines for the hdc all appear fine and is shared across all the cars in the mod too. That's why I say it's an oddball problem. Only happens with that one car. At this point I'm beginning to think its a problem in the Championship file. 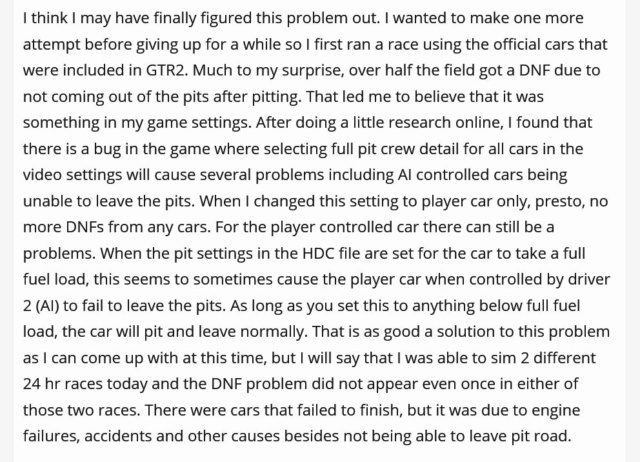 Prior to the swapped hdc file which it turns out is not common to all though the entire field of lines pertaining to pitting are identical, the original problem car now works perfectly however now other ai driven cars are either failing to restart or not pit whatsoever and run out of gas when they were fine before.